Apstra’s Networking Field Day 16 presentations highlighted key issues engineers face every day. The traditional ways of spinning up configurations and validating expected forwarding behavior falls short of the needs of networks of any size. 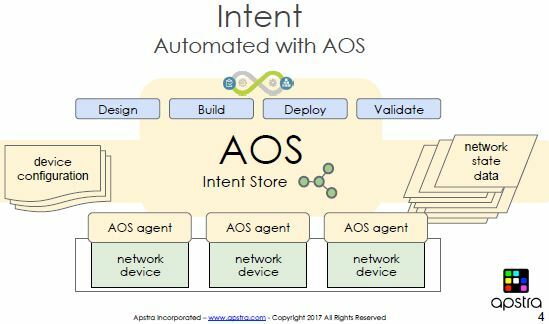 For anyone who has encountered a network where the documentation was woefully outdated or practically non-existent, and whose design requirements and purpose were deduced purely from rumors and vague supposition, Apstra offers AOS and its Intent Store. More than just configuration management, the idea of Apstra is to manage not just the building of consistent configurations abstracted from the specific hardware, but also to provide a controlled manner in which to address and manage network design revisions throughout the network’s life cycle. Changing business needs impart necessary modifications to device dependencies and performance, Apstra addresses these revisions by maintaining a single source of truth – the documented intent* – and providing tools to validate this intent. As Derick Winkworth said “it’s about moving the network [design] from being all in someone’s head” to making the design something consistent, tangible, and best of all, something that can be queried, and by extension, verified. Under the covers, Apstra makes use of graph theory, and for those who’d rather not Google that, the upshot is nodes get added and relationships get tied to nodes. The structure allows for a flexible schema that lends itself to ever-changing quantities of connections and also to new types of inter-dependencies between objects. For example, Apstra added the ability to create links between network nodes and the applications that run through them. This is done through some DevOps wizardary which this video highlights well, and the additional relationship mappings allow the network operator to query for application paths and diagnosis traffic flow issues. For a short how-is-this-useful-to-me, I highly recommend this explanation by Damien Garros on using Apstra to shorten the time it takes to deploy crazy amounts of security zones, validate them, and monitor them. Snazzy stuff for any engineer who has ever faced a security auditor.